Congratulations to all the newly engaged couples! Valentine’s Day marks the unofficial end of engagement season, and the start of wedding planning season. At the SS headquarters, we’re in the thick of working on wedding photo save the dates and invitations for our sensational couples. I have great partnerships with stationery companies, and I’m happy to have added a new one to the list…Basic Invite. I just received samples from them and was immediately impressed with the styles and quality. Many of our couples love photo save the dates, and that’s definitely one of the company’s specialities. 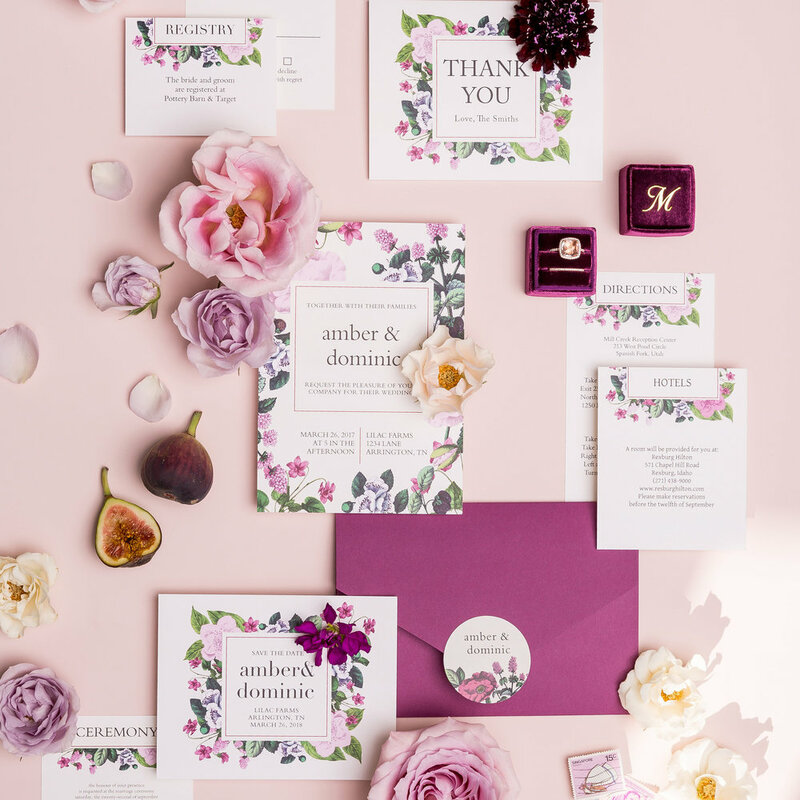 The Basic Invite difference is they offer competitive pricing and over 180 custom color options to make your event stationery as unique as you are. They also offer picture perfect pocket suites, unforgettable flat or raised foil, and much more that I’ve highlighted for you below. Free Wedding Websites - If you want a customizable website, just like your wedding invitations, they’ve got you covered! Their wedding websites are user and mobile friendly, and you can instantly upload your ceremony and reception details along with images and a map with directions which is super convenient for your guests. Almost Unlimited Colors - Basic Invite is one of the few websites that allows customers almost unlimited color options with instant previews online. Once you select a design you can change the color of each element on the card to over 180 different color options. So, you can make sure the card is exactly how you want it - down to the littlest detail. Custom Samples - As a major bonus, Basic Invite allows customers the ability to order a printed sample of their actual invitation, so they can see exactly how it will print as well as the paper quality before they ever have to place their final order. Over 40 Different Colors of Envelopes - Customers can choose from over 40 different colors when it comes to their envelopes, so that they can make their invitation stand out even before it is opened. All of their envelopes are peel and seal so the envelopes can be quickly and securely closed. Over 900 Wedding Invitation Sets - To ensure all of your wedding stationery is cohesive, Basic Invite offers wedding invitation sets, where you can find everything from save the dates to wedding invitations and enclosure cards, wedding menus, wedding programs and even matching thank you cards! Free Address Collection Service - If you can’t hire a calligrapher, you have the benefit of using Basic Invite’s free address collection service to request your addresses with just three simple steps. Share a link, collect addresses, and get free envelope printing. You can also simply upload the addresses if you have them already. Wedding Coasters - The bar and your wedding favors just got better! You can choose from over 90 professionally designed looks. Each design can be personalized instantly to match your wedding colors. And there are no color limitations which means you are free to make as many changes as you would like at no additional cost. Each coaster is printed using the latest print technology and on a premium 200lb matte cardstock. Thanks to this technology your coasters will have crisp, clean letters, photos, and graphics. *This post is sponsored by Basic Invite, and opinions are my own. As a DC wedding planner (and destination too), I’m in the thick of engagement season and loving every minute of hearing excited couples share their love stories and plans for their big day! Happy New Year to all the engaged couples reading this, and I hope that 2019 is treating you great so far! Are deeply in love - We truly believe the happiest couples are the most beautiful. Want your marriage to be more beautiful than the wedding - We aren't just advocates for your sensational wedding, but also for your sensational, life-long marriage. Can't wait to hit the dance floor at your reception - Somebody cue the Wobble! Appreciate modern style and personalized details - If you have impeccable style and desire to create a one of a kind wedding that’s all yours, then we love you already. Recognize that you need a planner with expertise that you can trust - Some couples come to us with many ideas already nailed down, and others with very few. However, they all share the commonality in needing the assurance and events management expertise of a professional planner. We love sharing valuable information with prospective couples up front, so you can begin to experience our commitment in being a resource you can trust and that will deliver. Desire a stress-free and enjoyable planning experience - Our couples want to fully enjoy their engagement, rather than stressing at every turn. Thus, they enjoy allowing us to take on the heavy lifting that comes with planning a wedding. All of our packages are created to provide the support you need and full day of wedding management, so you can relish in the excitement of your day without having to worry about a thing. Need assistance with finding the best venues and vendors in line with your specific needs - Since weeding through a huge vendor directory and sending out tons of inquiries is no fun, our couples love receiving our personalized, vetted vendor and venue recommendations. This gives them the assurance they are selecting the right choices. Consider yourselves to be foodies - Our couples enjoy a good meal, ranging from local mom and pop southern restaurants to posh, downtown fine dining. Needless to say, the food tasting is one of their favorite parts of the planning experience. Want your wedding to not only look good, but feel good - We marry sensational design and a sensational experience, and we believe weddings should be a perfect reflection of the couple. Thus, big smiles, happy tears, good times, tons of selfies, great dancing, family and friends reunion, exquisite design and details, and best of all - lots of love, can be found at a sensational wedding. Plan to invest in making your big day special - Our couples understand that just like they have invested into the growth of their relationship, memorable weddings require an investment, as well. Every couple, wedding and budget is unique, which is why we always ask prospective couples what are their top wedding wishes and priorities, so we can help them assess an ideal investment with their must haves in mind. There are so many more things that our couples value, but I figured I’d just share a top 10 today. If you see yourself in some or maybe even all of the above, let us know in the comments section. I’d also love to chat with you soon, as we have a few 2019 dates available and are also booking for 2020 weddings. We welcome you to submit your inquiry here, and we’ll respond shortly with some additional information and to get you set up for your complimentary consultation. If you're engaged and wondering how to choose your wedding party, today's Tips Tuesday post is just for you! Whether you're in any of the above categories or more, today I'm breaking down some tried and true tips to consider before you select your wedding party. Additionally, for those in category 5 above, I've had many couples opt out of having a wedding party and it worked out beautifully for them. In that case, it's almost as if all the guests are your wedding party and the ceremony focus is all on you. Now, for those of you who totally want your girls and/or guys right by your side, I suggest the following 5 tips. Think Quality over Quantity - Regardless of whether your fiancé has more friends than you or whether someone told you 5 was the magic number of bridesmaids to have, when it comes to your wedding party it's about quality and not a specific number. Ideal wedding party members are those who have your back, wholeheartedly support your union, are reliable, positive and always great to be around. Now if there are tons of friends/family who fit this category for you, it doesn't mean all 20 of them have to stand with you at the altar. I recommend sitting down with your fiancé and discussing the potential wedding party members you're considering, and get feedback from each other on who is essential for the role. Consider the Responsibilities - When someone accepts your invitation to be in your wedding party, they are essentially signing up to: be one of your bridal besties; stand in support of your union; help with some personal tasks you may need that are not handled by your wedding planner; buy their dress, shoes, and jewelry for the big day; pay for makeup and hair (if it's not gifted by you); help plan and attend your bridal shower and bachelorette party; show up on time for rehearsal, the wedding and other activities; and be a vital member in your bride tribe. While it's a fun job, for some that can be a big job or something they can't commit to due to other things going on in their life. Think long and hard about who would be all in or alternatively a headache, not able to commit, or unreliable. Choose from the Heart - Go with your gut and your heart when selecting your wedding party - NOT out of obligation. Just because someone has been your friend for years or because you were in their wedding party, doesn't mean you have to select them to be in your wedding party. Remember, just because someone isn't in your wedding party, doesn't mean they aren't very special to you. Children are optional - Nothing is cuter than a little flower girl and ring bearer! However, those roles aren't essential for every wedding. Perhaps you don't have children, nieces, nephews or godchildren to fill the role or maybe you don't want any kids at the wedding at all - that's totally ok. Alternatively, if you do want children in your wedding party, my suggestion is to choose children who will happily go down the aisle. On the flip-side, if they cry uncontrollably on day of, don't force them to walk down the aisle. Bridal Shower and/or Bachelorette Party Hosting - the wedding party doesn't necessarily have to host your pre-wedding celebrations, so if close family and friends volunteer to host and you love their knack for entertaining, let them throw your shindigs! A final thought I'd like to share for those who may struggle with people pleasing is something I tell couples all the time - "it's your day, so do what feels right for you two and you two alone". Never feel obligated or pressured to go out of your way to include family and friends in certain roles for the wedding, as that shouldn't be the sole indicator of how close you are or aren't to someone. Those who truly love you will be honored to simply attend and celebrate your nuptials, with no strings attached. I hope you found these tips to be super helpful, and that you're better equipped to pick your I DO crew. Now let's chat in the comments - share some other tips you'd add to the list or questions you may have surrounding this topic. I'd love to connect with you!